The First Ladies National Historic Site, operated and managed by the National First Ladies' Library, is housed in two buildings. One is the Ida Saxton McKinley Historic Home and the other building, just a block north, is the Education & Research Center where the museum is housed. BOTH buildings are handicapped accessible. NO PHOTOS OR VIDEOS are permitted to be taken in the Research & Education building. Planning Your Visit: The First Ladies National Historic Site is open to the public year round, Tuesday's through Saturday's. We are also open on Sunday afternoons during the summer months of June, July and August. 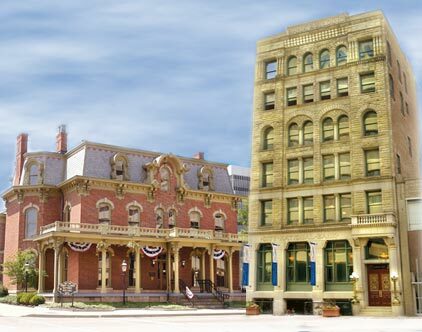 Your visit begins in our restored 1895 bank building, our Museum, where guests pay for their admission and check in for the guided tour of the Saxton McKinley House. The museum exhibit, located in this building, is a self-guided experience that takes most guests about 45 minutes to see. Tours of the Saxton McKinley House are guided only and take place approximately every hour (The last tour of the day always begins at 3:00 pm). Tour size is limited and preference is given to guests who call ahead to make a reservation. Guests without reservations will be added into a tour depending on the availability for the day. While reservations are not required for 1-5 people, they are highly recommended due to the size limitation and to ensure you get the tour time of your choosing. Reservations are highly recommended as tour size is limited. Reservations are REQUIRED for groups of 6 or more. Please call or email to reserve in advance. Please note that the last tour of the day always begins promptly at 3:00 pm and the site closes to the public when the final tour is complete. guests wishing to see both buildings must arrive prior to 3:00 pm to have time to do so. Reservations required for groups of 6 or more only and HIGHLY recommended for all others. We are CLOSED ON: Presidents Day, Memorial Day, 4th of July, Labor Day, Thanksgiving, Christmas Day & New Years Day. *Discounted admission is available for guests with the America the Beautiful National park Pass. The pass MUST be presented at check in to receive the discount. Gated parking is available free of charge, code given upon arrival at the entrance of the parking lot. Bus parking also available free of charge. Follow I-77 North to the Downtown/Tuscarawas Exit. Turn right onto Tuscarawas and travel to Central Plaza South/ Market Avenue South. Turn right onto Central Plaza S/ Market Street S. Travel through two lights, our gated parking lot is immediately after 2nd light on the right side. Press the intercom buttom for the gate code. Follow I-77 South to Exit 105/Tuscarawas/Downtown. Turn left onto Tuscarawas Street. Go through eight traffic lights to Central Plaza S/ Market Ave., turn right. Go through two lights,our gated parking lot is immediately after 2nd light on the right side. Press intercom button for the gate code. Take I-71 North to 30 East. Exit at Downtown/Cherry Ave. Turn right off exit ramp travel to Second Street. Turn left onto Second Street SE and travel to Market Ave. Turn left onto Market Ave. S and travel 1 block. Just past light at Third Street SW is our gated parking lot on the right. Press the intercom button for the gate code. Take I-76 to I-77 South. Follow I-77 South to Exit 105/Tuscarawas/Downtown. Turn left onto Tuscarawas Street. Go through eight traffic lights to Central Plaza S./ Market Avenue S, turn right. Go through two lights,our gated parking lot is immediately after 2nd light on the right side. Press the intercom button for the gate code.